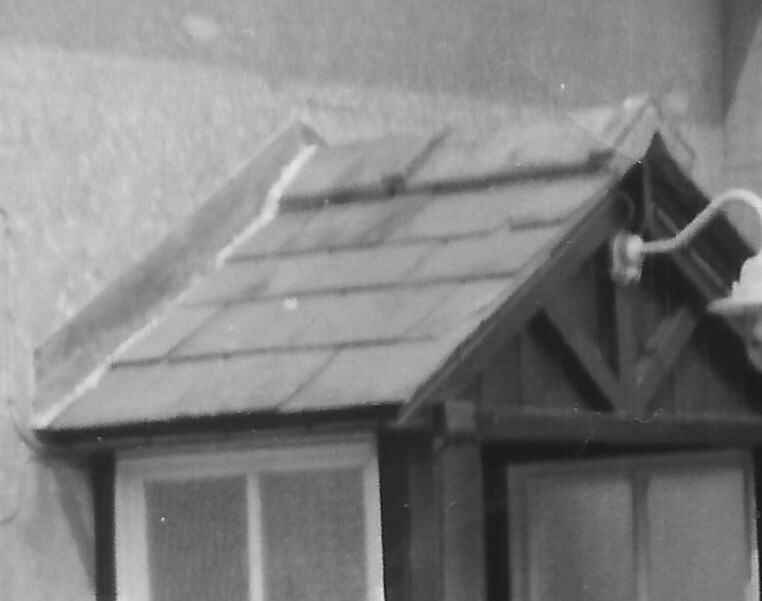 It’s 48 Farm Hill, Woodingdean, the house I lived in between 1963 and 1979 (age 5 – 21 when I moved out and got married). This is the house after we had a front porch fitted. Before that the wind would blow through the front door and it got really cold indoors! With the new porch things got a lot warmer inside. 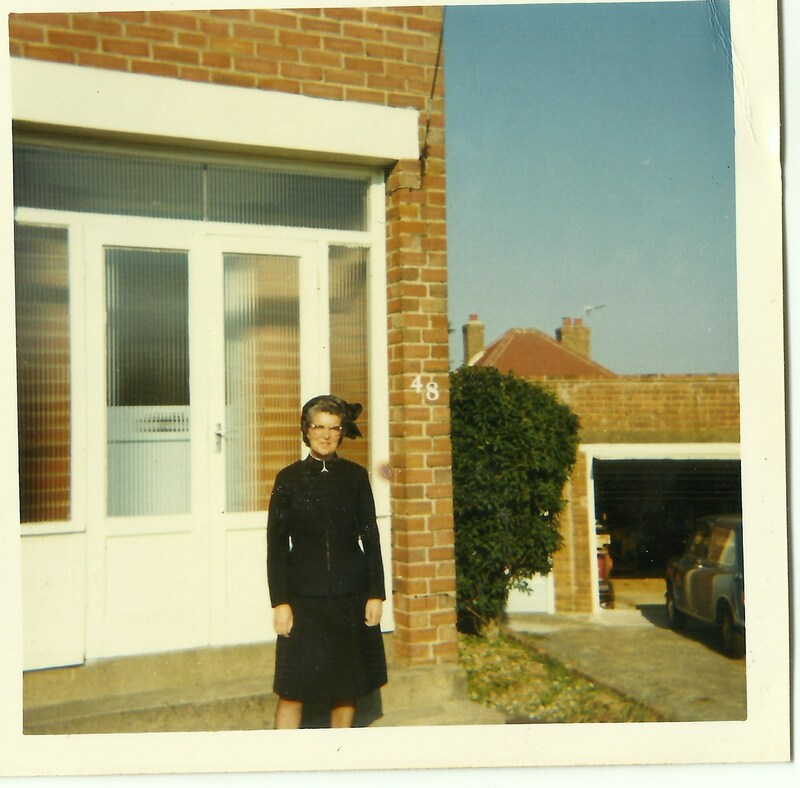 This photograph shows my mum outside the house, in her Salvation Army uniform. She was in the ‘Army’ from about 1970 – 1976 and she really loved it. With all her Church activities she would always take me along, it was very important to her. Dad always supported her, but never joined in. He would stay home while we went to Church. I have more photographs of ‘The Salvation Army Years’, and here they are. 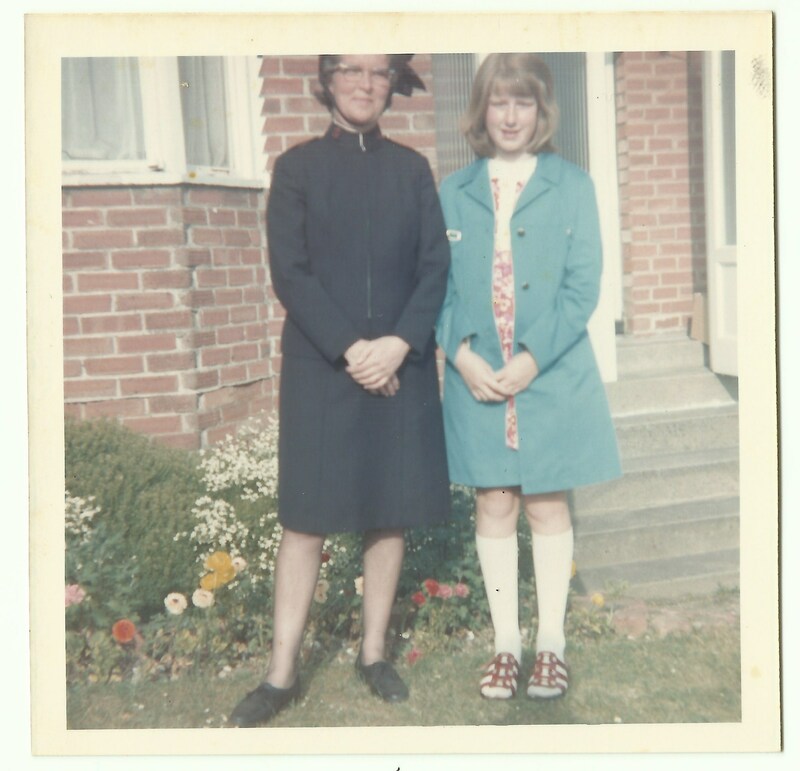 The first photo is of me with Mum, before I got my uniform. The second is one of Mum with a copy of ‘The War Cry’ the Salvation Army newspaper. She went out every Friday or Saturday evening, selling it in the pubs in Brighton. This was something she really enjoyed doing, I think the uniform and selling the War Cry gave her an identity she felt she was lacking. She was very proud to go out in her uniform. As a young teenager I found it quite embarrassing and always hoped no one from school would see me on the bus in my uniform on the way to the Congress Hall, at The Level, Brighton. 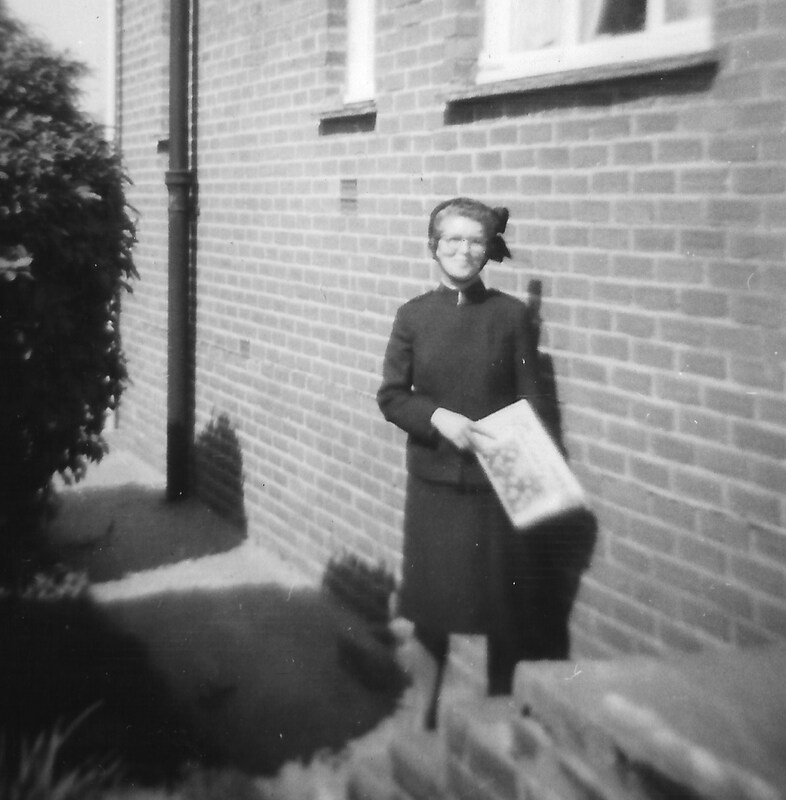 Mum also played the piano for a group of women called ‘The Home League Singers’ and she would go once a week to an Old People’s Home for retired officers of the Salvation Army and lead a meeting there. I got dragged in and was in the Singing Company when I was younger, then joined The Songsters as an adult, as well as playing the timbrel and doing lots and lots of Bible Study. I was a Sunday school teacher there, and enjoyed that very much. This entry was posted in Churches, Enid May Howells, jackiedinnis, The Salvation Army and tagged Farm Hill, front porch, Salvation Army, The Salvation Army, The War Cry, Uniform, Woodingdean. Bookmark the permalink. 2 Responses to Whose Door Is This? Very nostalgic seeing your house Jackie!! And the photos… I remember her in her uniform!